Yesterday night, when the results of the presidential election started showing an irreversible victory for Obama, the President decided to celebrate the moment by posting a picture in which he and his wife Michelle were hugging with the sky as a background. The picture was posted both on Facebook and on Twitter, and in both cases it was accompanied with a message saying "four more years." Four hours after being published, a page run by Facebook employees informed that the photo was already the most liked picture ever on that social network. Something similar happened on Twitter, where according to many sources the tweet is by now the most shared tweet ever. At the moment when this note is being written the picture on Facebook has more than three and a half million likes and has been shared almost five hundred thousand times. The tweet on Twitter, on the other hand, has been retweeted almost seven hundred thousand times and has been selected as a favorite almost two hundred fifty thousand times. These numbers will surely increase during the next days. 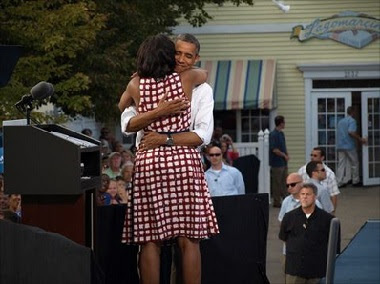 UPDATE (November 9, 2012): Although the picture was posted by Obama to celebrate his victory in the presidential election of November 6, the hug shown in it didn't take place that day: it took place almost three months earlier, on August 15, 2012, in Davenport Iowa. This information can be verified by seeing a post made on August 16 in a page called "Women for America," which is run by President Obama's 2012 campaign called "Obama for America." Although we cannot see the sky as a background in this view, which is from above, other pictures of that event, such as the ones posted on that month of August that can be seen here, show that when the same hug was taken from below, the sky was indeed the background. First photo via Barack Obama on Twitter and Facebook.